Lauren Wayne loves music. As general manager and talent buyer for Crobo, Wayne promotes over 260 concerts in Portland every year. Crobo owns and operates the State Theatre and Port City Music Hall, and the company is the exclusive, live-concert promoter for the new outdoor music venue at Thompson’s Point. 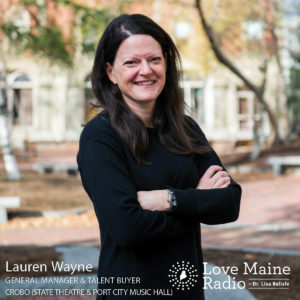 Starting as the company’s only employee in 2010, she has grown the company to include eight full-time staff and over 150 part-time employees, and she oversaw the largest music festival ever in Portland (with Mumford and Sons on the Eastern Prom in 2012). She is based in Portland.